Last week, President Elect Donald Trump tweeted that people who burn flags should lose their citizenship or go to jail. 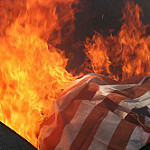 We explore the history of flag burning and 1st amendment rights. University of Washington Professor of History, Bill Rorabaugh, shares a little history of flag burning with KBCS Producer, Angie Voyles Askham.